It works quite simply by allowing the user to draw one continuous line between the letters on the keyboard which make up your chosen words. 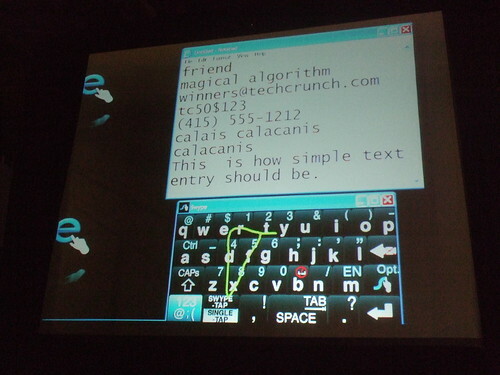 It automatically puts spaces into the sentence when you lift off your finger to start the next word. Its fairly hard to get used to at first and that’s not just because of the new way of typing. There are other differences such as the layout of symbols, removal of the button to hide the keyboard and the introduction of a microphone key. it’s slightly alarming at first but you get used to it the more you use it. One of the harder elements to get used to is the new predictive text (unfortunately out doesn’t iuse the same library as the default keyboard) and making edits to text you have already written. Typing words which contain double letters also seems a little tricky resulting in a little finger wiggle to get it sorted. Above all it’s pretty satisfying to use especially when it comes to typing longer words and the actual user input is fairly easy and interesting. Much more thought is required when putting in the words though, and if you make a mistake on a long word then it can be annoying. After using the input for a little while and to start writing this blog article, I have found that it is definitely quicker than the standard htc keyboard. That is only if you use one finger to type. If you are a multi-finger touch screen typist, then stick with that! The swype keyboard has specific other uses too, such as aboard public transport. Not having to lift your finger from the keyboard as often definitely improves accuracy! The use of hardware is petty good and performance verses the default HTC Hero keyboard is definitely better and it copes with hardware lag better and more obviously. Overall I would recommend giving it a try. Its now my default keyboard for most things except entering postcodes and telephone numbers! And the best bit is that you can choose when to use it, and even switch to it half way through typing!! thanks for the positive writeup. try drawing trace from ‘swype’ key (bottom left) to the ‘g’ key. it is a shortcut to bringing up our numeric keypad layer…should help with entering #’s. Lots of other great shortcuts/tips on our website. Thanks for the tips Mike. Those shortcuts are pretty cool, especially the additional selecting, copying and pasting options. those will definitely help when working on longer copy. I’ll make sure I take a look at the website for some more tips too!